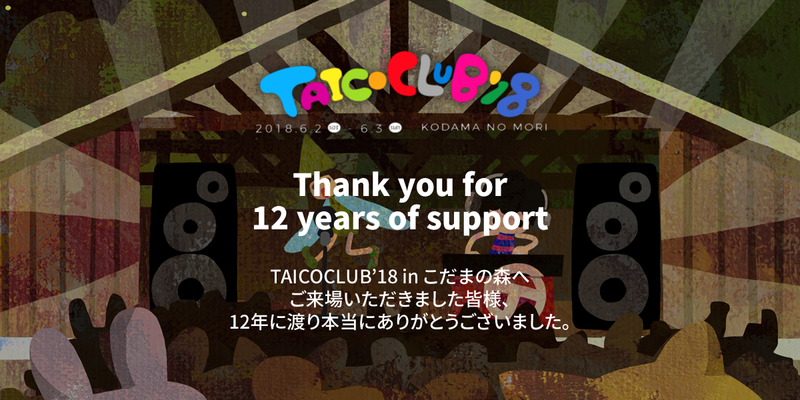 To everyone who attended “TAICOCLUB ’18 in Kodama no Mori” – Thank you so much for coming, and thank you for the past 12 years. It is because of the local people, involved staffs, the artists who graced our stage, and those who attended, that we were able to succeed in holding festival after festival since 2006. We have a renewed sense that TAICOCLUB was something that was created by all of these people, and we feel nothing but heartfelt gratitude. Thank you all so, so much. We were also very lucky that we were able to find a wonderful location such as Kodama no Mori. This year’s “TAICOCLUB in Kodama no Mori” will be the last one. From now on, TAICOCLUB will work as an organization to make efforts for the future. We will not be holding festivals for a while, and will instead be taking time to work on producing new systems and locations. Hopefully we will be able to make some announcements regarding this soon. Please look forward to it. Meanwhile, we would like to ask for your continued support. We also want to take advantage of this environment that we have created and provide an opportunity where we can all meet up again, sometime around 2023. We sincerely look forward to seeing you again in the future. Please be aware that lost items can only be stored until Tuesday, July 31st. Again, thank you so much for the past 12 years.